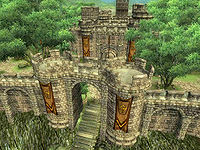 Castle Bravil is on Bravil's southeastern island, separate from the rest of the city. It is the seat of the Count of Bravil, Count Regulus Terentius. 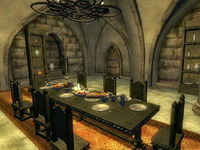 The castle is divided into the Castle Bravil Great Hall, Castle Bravil Barracks, Castle Bravil Dining Hall, Castle Bravil Dungeon, Castle Bravil Servant's Quarters, Private Quarters East Wing, and Lord's Manor North Wing. If you break into Fathis Aren's quarters, you'll find a secret passage into Bravil Wizard's Grotto that leads to Fathis Aren's Tower. Outside, the castle gardens are much more visually pleasing than the rest of the city, and Dro'shanji can often be found there. 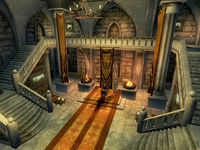 Upon entering the front doors of Castle Bravil, in the area to the right in front of the stairs a display case locked with a very hard lock holds a bronze amulet and a copper amulet. The door next to it leads to the Dining Hall. The Count's throne sits directly across from the front doors, and the two display cases behind it are both locked with hard locks. The northernmost one holds three emeralds, two of them flawed, and a copy of the skill book Battle of Sancre Tor, while the other holds three daggers - a glass replica, an ebony replica, and a silver dagger. The display case on the first landing of the northern set of stairs is locked with a hard lock and contains an ebony mace replica and another glass dagger replica. On the balcony at the top of the stairs, the door on the north end leads to the Barracks, the door on the south end leads to the Private Quarters East Wing, and the door in the middle leads to the Lord's Manor North Wing. The door into the barracks reveals open connecting rooms. In the room on the left, to the west, seven beds line the west wall. The three chests on the floor here contain clutter and/or minor loot, and the one in the nook on the east wall contains armor and/or weapons. The armor/weapons chest does not respawn. The bookshelf on the wall between the beds holds a copy of 2920, Evening Star and a copy of the skill book Light Armor Repair. In the room to the east, a round table holds three potatos, two carrots, a loaf of bread, and a bottle of mead. Further into the area are two more tables, these square. The one on the west wall holds a potato, two carrots, and a bottle of mead, and the one on the east wall holds another bottle of mead. Two barrels in the corner hold food in the first, clutter and/or a repair hammer in the one next to the cupboard. This cupboard also holds food, and the cupboard in the other corner holds drinks. Through the door opposite the entrance, Viera Lerus' small bedroom has a single bed in the northeast corner. The cupboard next to the door holds clothing, and the desk on the west wall holds clutter and possibly a common book. The door into the Dining Hall from the Great Hall reveals an entry hallway; the door to the right leads to the Dungeon. The cupboard on the east side of this hall contains dishes, and the room at the end of the hall is a large dining room with a table that seats eight. On the table are eight strawberries, three tomatos, two carrots, a loaf of bread, a pumpkin, and a cheese wedge. The cupboard in the southwest corner holds food. The chest on the bookshelf in the northeast corner holds clutter and/or minor loot. The two sacks on the floor in the southeast corner contain clutter and/or minor loot, and do not respawn. The door in this corner leads to a small room with two more doors; the one on the west wall leads to the Servant's Quarters, while the door on the east wall leads to a small entryway. Through the open doorway is a large storage room. Immediately to the right, a barrel contains clutter and/or a repair hammer, and the cupboard next to it contains drinks. The next cupboard along the wall contains food. On the rug a little bit away from the wall a bookshelf holds two loaves of bread and three ears of corn. On the table in front of the bookshelf are three heads of lettuce, two pumpkins, and an apple. In the southeast corner are four more clutter/repair hammer barrels, and two sacks on the floor next to them contain more clutter, as does the cupboard next to them. The wine racks on the east wall hold three bottles of Tamika's West Weald Wine and four bottles of Surilie Brothers Wine, and another bottle of each sits on the ledge next to the racks. In the northeast corner are three clutter/repair hammer crates, and two barrels with the same contents, along with another barrel that contains food on top of one of the crates. On the bookshelves on the north wall next to the fireplace, two baskets hold three oranges and six strawberries. On the west wall next to the fireplace are three crates and two barrels, all containing clutter and/or repair hammers. The door to the Dungeon reveals a small entrance. On the table opposite the door sits a clutter sack as well as a copy of the skill book The Importance of Where. The sack on the floor next to the desk also contains clutter. In the southeast corner, along with the stolen goods chest, is a clutter/repair hammer crate. The cupboard behind the table contains food, and the door next to it leads to a small sleeping quarters with two single beds on the western wall. The chests at the foot of each contain clutter and/or minor loot. On the east wall is another clutter/repair hammer crate. The other door in the entrance room leads into a long hallway that slopes downward and a short set of stairs at the end. The first cell door on the left reveals a cell with a single bed, a chair, and a bowl. The second cell door on the left is a smaller cell with only a bedroll and a cup. The cell door on the right is also very small, and contains only a bedroll. At the end of this hallway, around the corner to the left, is a large storage room. In the northeast corner, a crate contains clutter and/or a repair hammer, and the chest next to it contains clutter and/or minor loot. The covered bowl on the bookshelf next to the chest contains food. The chest of drawers in the southeast corner contains clutter, and the three barrels next to it contain clutter and/or repair hammers. In the northwest corner two tied sacks contain clutter, and two untied sacks contain food. Two barrels in the southwest corner also contain clutter and/or repair hammers, and the chest next to them contains armor and/or weapons and does not respawn. The five chests here all contain clutter and/or repair hammers. The door in the south wall leads into a smaller room. Blood is sprayed across the two rectangular tables here, a pair of calipers on one and a pair of shears on the other. The bookshelf in the southwest corner holds two skulls, and a pickaxe leans against the wall next to it, with a pelvis bone on the floor in front of it. The two crates on the east wall contain clutter and/or repair hammers. A steel mace sits on the table in front of the crates, and a pitchfork lies on the floor in front of it. The two chests of drawers on the south wall contain clutter. The door into the Servant's Quarters leads down a long staircase to a long hallway. At the end of the hallway, a large bedroom has three double beds against the north wall. The chests of drawers at the foot of the first two both contain clothing. The two cupboards in the southeast corner contain food, as does the covered bowl on the floor between the two empty barrels nearby. The chest next to the cupboards contains armor and/or weapons, and does not respawn. The two cupboards in the southwest corner also contain food, with a head of lettuce on top of one and two loaves of bread on top of the other. The wine rack next to the cupboard holds six bottles of cheap wine. Another bottle sits on the floor behind the bar, on top of which sits five apples, three carrots, and two cheese wedges. On the table in the middle of the room is another bottle of cheap wine. The door into the Private Quarters is at one end of a long hallway. The first turn on the right (west) has a chest of drawers which contains clothing and leads to a door which in turn reveals Dro'Nahrahe's bedroom, with her double bed on the west wall. The desk on the north wall contains clutter and the possibility of a common book, and the chest of drawers next to it contains clothing. The chest in the southwest corner is open and empty. The table on the south wall holds a single loaf of bread, and the chest next to the doorway contains clutter and/or minor loot. In the entry hallway, the first turn on the left (east) leads to a door which reveals Drels Theran's large bedroom, with his double bed on the east wall; the chest at the foot contains clutter and/or minor loot. The two sacks next to the bed contain clutter. The table in the southeast corner holds two cheese wedges and three pieces of gold. The cupboard in the southwest corner contains clothing, and the two barrels next to it contain food. The five barrels in the northeast corner contain clutter and/or repair hammers. 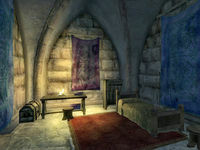 The chest of drawers on the north wall contains clothing, and the bookshelf next to it contains food and drinks, while holding a copy of the skill book Song Of Hrormir on one shelf and a jewelry chest on another. Another clutter/repair hammer barrel sits in the northeast corner, and two clutter sacks sit on the floor next to it. The chest of drawers next to the sacks contains clothing. The door at the end of the entrance hall leads to a large room with a round table in the southeast corner that holds three apples. Further into this area, two crates in the northeast corner and two barrels in the northwest corner all contain clutter and/or repair hammers, and the cupboard on the west wall contains food. The door next to the door from the main entrance hallway leads into a small forge room, where an iron cuirass sits on a table on the west wall. The door across from the door from the main entrance hall leads to Hans Black-Nail's small bedroom, with his single bed on the west wall. The cupboard at the head of the bed contains clutter, and the table next to it holds a copy of Mythic Dawn Commentaries 1, and another copy under the table. The chest next to this table also holds clutter, as does the chest of drawers in the northeast corner. The door into the Lord's Manor from the Great Hall reveals a hallway that leads ahead to the east and left to the north. 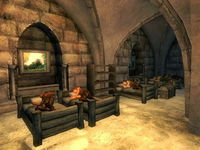 The turn to the north leads to Fathis Aren's large bedroom, with his double bed on the east wall; the chest of drawers at the foot of the bed contains clothing as does the chest of drawers in the northeast corner. The round table in the southwest corner holds a bottle of cheap wine. The bookshelf behind the table holds five more bottles of cheap wine, three bottles of Surilie Brothers Wine, and two bottles of Tamika's West Weald Wine, with another bottle of Surilie on the floor next to it. Another bottle of cheap wine is on the floor in front of the kegs here. The two crates in the corner contain clutter and/or repair hammers, and the chest next to them may contain clutter, gold, jewelry, and/or scrolls, while the chest next to it may contain clutter, gold, armor, weapons, gems, and/or soul gems. 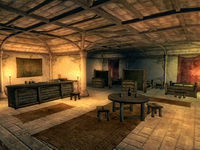 The tables in front of the empty barrels in the northwest corner holds two alembics, a retort, and a mortar and pestle. The two cupboards in the middle of the room contain clutter and clothing, and the chest of drawers against the backs of them contain clothing, with a small jewelry chest on top of one. The ledge in the north wall is actually a secret door that leads to a door to the Bravil Wizard's Grotto. Back in the entrance hallway, to the east the hall continues until it comes into an open area with a door on the north wall and a door on the east wall. The chest of drawers next to the north door contains clothing. The door on the north wall leads into Gellius Terentius' large bedroom, with his double bed in the northwest corner. The bookshelf also in this corner holds a jewelry chest. In the southwest corner, a tiny table holds a bottle of cheap wine and a bottle of Tamika's West Weald Wine, and the bookshelf behind it holds another two bottles of cheap wine, a bottle of Tamika's West Weald Wine, a bottle of Surilie Brothers Wine, and a bottle of Tamika Vintage 399. The desk on the north wall holds clutter and possibly a common book. The chest in the northeast corner contains clutter, as does the sack on the floor next to it. The two cupboards in the southeast corner contain food and drinks. The table in the middle of the room holds six strawberries and four tables. Behind the bed in a wooden chest are 3 bottles of Skooma. The other door at the end of the hall, on the east wall, leads into Count Regulus Terentius' bedroom, his double bed on the east wall. The table on the wall next to the bed holds a small jewelry chest. In the southwest corner, a desk holds a copy of Five Songs of King Wulfharth on top, and the cupboard behind it holds a copy of the skill book Father Of The Niben and a bottle of Cyrodilic brandy. In the northwest corner, a large table holds six strawberries, three carrots, and a bottle of Surilie Brothers Vintage 399. The desk in the northeast corner holds clutter and possibly a common book, and the two chests near it contain clutter and/or minor loot. Buying a house in Bravil: Purchase a small house on the far side of the canal in Bravil. Esta página foi modificada pela última vez à(s) 04h25min de 9 de agosto de 2013.